Its been awhile since my last blog post, and for the past few weeks I've seen people sharing my previous articles on Facebook and had the strong urge to write something good that would be appreciated by the general blog readers. I've been so busy recently with work and school and hardly had any time. When most of us girls are younger, we fantasize about bad boys, boys with tattoos, who bravely get into fights for us and basically one who has that whole 'rebel' image. As we grow older, some of us happily settle for a decent, good looking guy while the rest focus on our careers or dream of getting a rich boyfriend with a sports car and a full wallet or a Abercrombie-model-kind-of-handsome boyfriend. The few fortunate ones, do get a loyal, good looking and wealthy boyfriends, but unfortunately for the minority, they are left with broken hearts and questions with what went wrong. Apart from the usual basics of every relationship- honesty, being faithful, etc, here is my own list of 7 ways to tell if he will make a good boyfriend for the remaining of us who don't quite know what we are looking for. 1. He listens. And remembers. I think if you read and follow my posts closely, I really dislike people who don't listen. It's perfectly fine to like talking about yourself. But a good man would listen to you, and remember the little things you tell him about yourself. The cheap Accessorize bracelet you told him you like? He will surprise you with it. The craving you had for durian? He will bring you for durian. I really don't know about other females, but for me, it's not quite the amount of money spent but knowing that he listens and remembers, is definitely one of the best traits you will find in a good boyfriend. 2. He gives you your space, but you know he will always be there for you. When you need him, you know he will be there. You don't feel held back calling him for no reason, you don't feel needy asking him out spontaneously and basically, you feel absolutely comfortable around him. You know the feeling you get: "Should I text him or wait for him to text me?" If you still feel like that after dating a person for weeks, it's a sign that you're unsure of him and if your feelings for him are reciprocated. Not good. 3. He makes you feel wanted. The last thing every woman wants is a clingy guy. Sure, it can be cute at first but it gets exasperating if it goes on for too long especially if you have your own commitments like work or school. Making you feel wanted is letting you feel that despite his busy schedule, he wants to see you, because "your smile brightens up his day". 4. Encourages and supports your dreams and goals. This is one of my rules that I adhere closely to for relationships. Reason: As some of you would have realized, i have a day job but also work in the night life: clubs / discos. The guys I dated during this period were uncomfortable BUT supportive of my decision. The money is to be used for my studies and that is my eventual goal. It may not sound good, but I guess some of us have to work a little harder. Back to the point: I wouldn't date someone who discourages me from doing what I need to do to achieve my goals. It is a warning sign that he is selfish, and only focuses on his needs, pride and ideas. Much reconsideration is needed if you are dating someone like that now. However, if you are dating someone that strongly encourages you to pursue your goals, who gives you rational, unbiased advice and who let's you rant about the stress you are facing without telling you to give up, you've met a good man. Treasure him! 5. He has a life. An attractive trait a man should have is having his own life. He has a career, or school and he works hard. This doesn't mean he will neglect you. It shows that he is capable and independent. He has his own social circle which he introduces to you. His friends make you feel like one of them and you love hanging out with them. He makes plans to hang out with his family and friends and invites you along, because he wants you to meet them. On a side note, if your guy has issues introducing you to his friends - something is wrong. He should be nothing, but proud of you. 6. He is nice to everyone. I know as much as we would like him to tell his ex girlfriend to "f*** off", do realize that some day you could be that ex girlfriend of his and it's going to hurt if he says that to you. If he lets her down gently, and slowly edges out of her life, you can be sure he won't be mean to you either. That's a pretty good trait to me. If he is kind to old people, to waiters; empathizes with the less fortunate, he is a genuinely nice person. Most importantly he should respect his parents, and treat them well. A filial son is a huge turn on and I love guys who are closely bonded with their family members. 7. He shows you that he loves you. I've never believed in saying "I love you" to someone unless I genuinely mean it. I don't think it is necessary too. Love is a very very deep word and nowadays it is often loosely used nowadays. Loving someone is not just by proclaiming your love all over Facebook, it's about showing the person through actions. Instead of simply choosing to believe what he tells you, (afterall everyone wants to believe the nice things we hear and block out the warning signs) note the things he do for you like picking you up after work and bringing you for dinner, getting you a new bag because your bag is broken and so on. If a guy shows you through actions that make you feel that you truly mean the world to him, NEVER let him go! I hope this post helped some of you have a clearer head and also to treasure the guy you have already. Never take a good guy like that for granted because each time you disappoint him or put him down, he will get disheartened over time. If you liked this post, please share it! :) Thank you for reading! It is the latest upgraded beauty collagen drink from Japan, you know how Japanese women have such fair and smooth skin? I've always coveted blemish free and fair skin, so I was really excited to try out this product knowing it's from Japan. NANO Collagen is said to be the ultimate beauty drink for everyone who wishes to maintain their youthful looks, and has health anti-aging benefits. I like that this is a luxury product and yet functional at the same time and I learnt that the formula took 6 years to fully develop and come to perfection. That is a looong time! Just as how a baby needs to drink its nutritious milk and an elderly needs to drink formulated milk for heart health and bones strength, NANO Collagen is the ultimate beauty drink for everyone who wants to look as young as now, 20 years from now. It is recommended for those between 20 years old to 50 years old to drink NANO Collagen for the best beauty and health anti-aging benefits. It is also made from the highest quality of active ingredients and also has the highest amount (5,500mg) of collagen peptide in every (7gm) scoop for everyday anti-aging skin enhancement. With so many health benefits, adding to the beauty benefit, I am more than willing to consume this drink every day! My mom constantly nags me to wear foundation that protects my skin from the sun, or carry an umbrella, because you know how the sun does damage on your skin in the long term? But now, with NANO Collagen, I feel that this is my secret to protecting my skin from within, and it's not just temporary, it's for the long term! 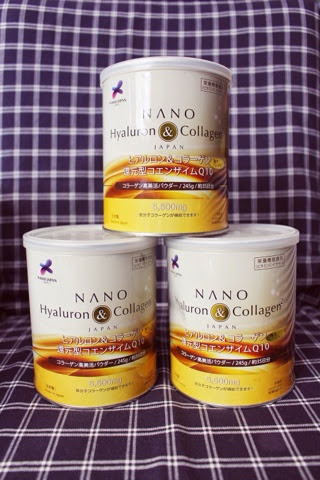 NANO Collagen also use only natural ingredients and is tested by Japan Food Research Laboratory and the Singapore AVA Food Safety Lab to be of above safety and quality standards. Furthermore, NANO Collagen does not use any pig or shell-sources derivatives and is also certified HALAL by the Islamic Food Research Council, Malaysia and HK to be suitable for Muslims! It is a product meant for every one to enjoy it's benefits. I would recommend mixing it in milky drinks like milo and hot chocolate, it tastes just a little sweet without any hint of the "fishy" smell of collagen products because NANO Collagen invested a patented biotechnology to remove the "fishy"smell and "nanoized" the powder to half the particle size of other collagen powders for faster dissolving and body absorption. 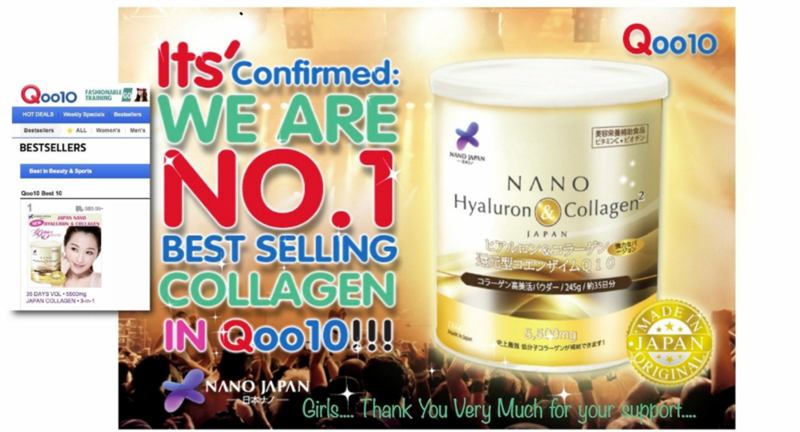 NANO Collagen is 100% made in Japan and is currently available in Japan, Hong Kong and Singapore only, it is the NUMBER 1 Best Selling Collagen in Qoo10!!! The ingredients are best in the market, containing hyaluron, elastin, biotin, lactic acid bacteria, Vitamin B, Vitamin C, Vitamin E, CoQ10, and Hatogumi extract as mentioned above. Keep your skin healthy and improve it with NANO Collagen today, maintain your youthful looks. Many Asian customers purchase this product from Singapore via Qoo10, you can purchase it from the following online stores below!